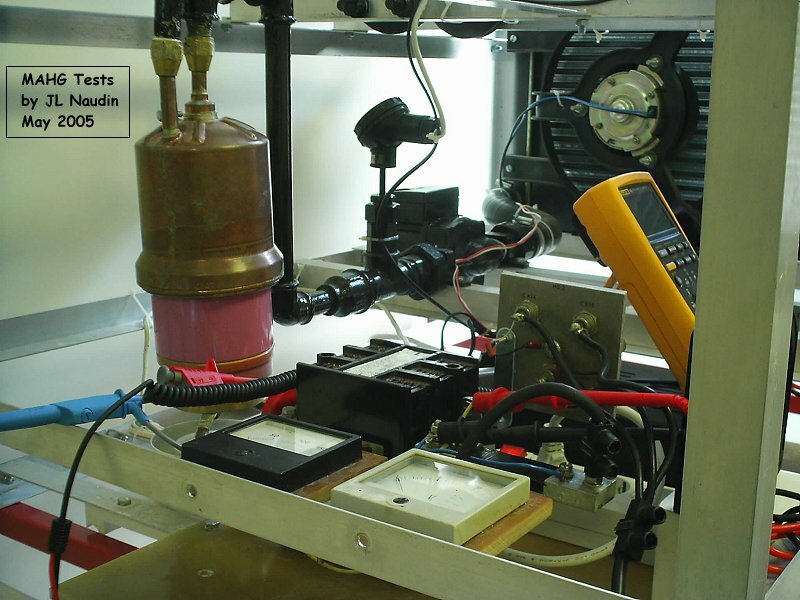 The Moller's Atomic Hydrogen Generator (MAHG) is fully based on the Irving Langmuir discovery. In the MAHG, the hydrogen is merely dissociated and recombined and can therefore be recycled over and over again without consuming more hydrogen than the quantity used to start with. The Atomic Hydrogen Process is 100% CLEAN and SAFE. 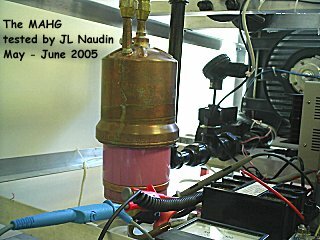 The MAHG tube has been specially designed : It is composed by a water cooled vaccum tube filled with hydrogen at 0.1 atm. The main part of the MAHG is a tungsten filament (0.25 mm diameter) placed in the center. 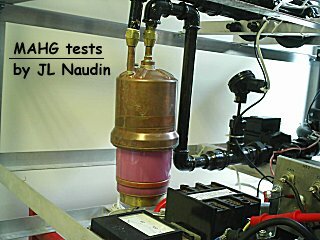 In the MAHG the hydrogen is NOT consummed during the process. 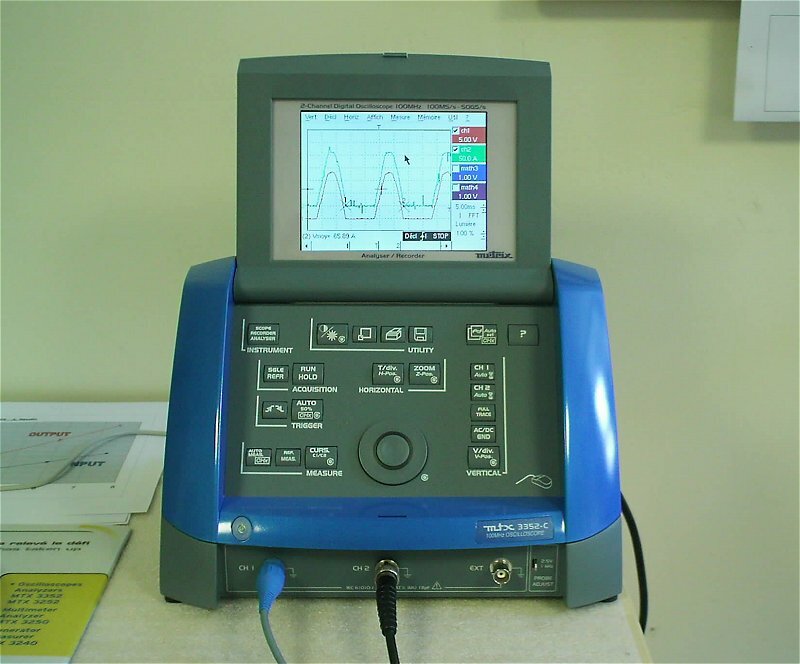 Digital oscilloscope (MTX3352-C) with a current clamp (VC 601). RUNS 1 to 10 have been conducted for tuning purposes and mechanical adjustments. 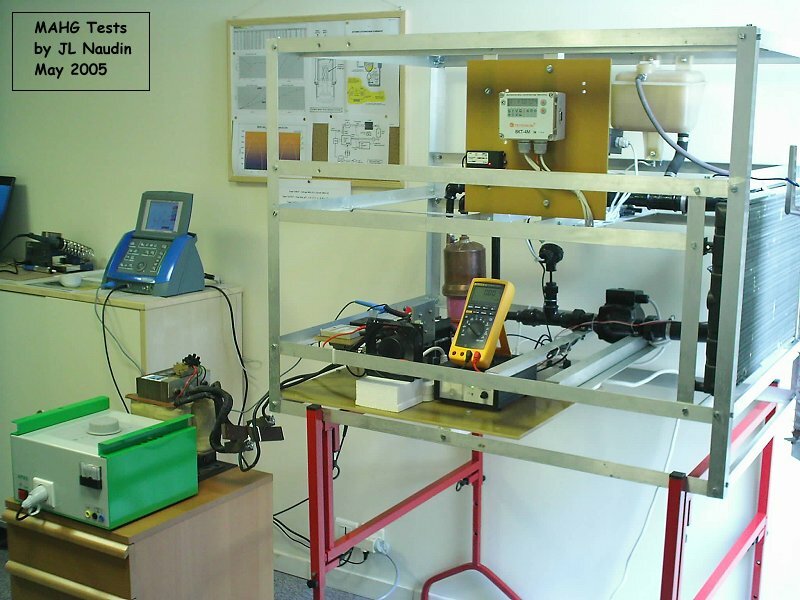 The full tests datas used in the graphs in DC pulsed mode have been conducted between the RUN 11 to 37. RUNS 26 to 37 have been done with the same current level (about 67 A) to check the variability of the results. The average efficiency measured has been 224% with a net power gain of 464 Watts. RUNS 38 to 40 have been performed with a PURE DC current. 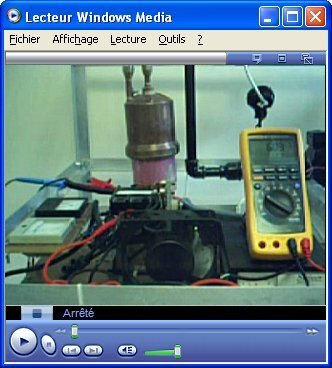 The pulsed transformer unit has been replaced with a High Current DC Power Supply. As you may notice in the experimental results, the average efficiency measured has been 64%, so there are 36% of losses in the device. With pure DC, the filament temperature (774 °K) is not sufficient to create the hydrogen dissociation process which requires at least 2000°K. RUNS 38 to 40 can be considered as BLANK TESTS of the MAHG reactor, see the curve of "Temperature of the filament VS Time" below. The Current Vs Voltage curve : you may notice that the resistance of the tungsten filament is non linear. The curve above shows the percentage of hydrogen dissociated into atomic hydrogen Vs the temperature of the tungsten. These datas have been published by Irving Langmuir in March 1926. The experimental curve above shows the MAHG filament (the cathod) temperature VS time during the tests. 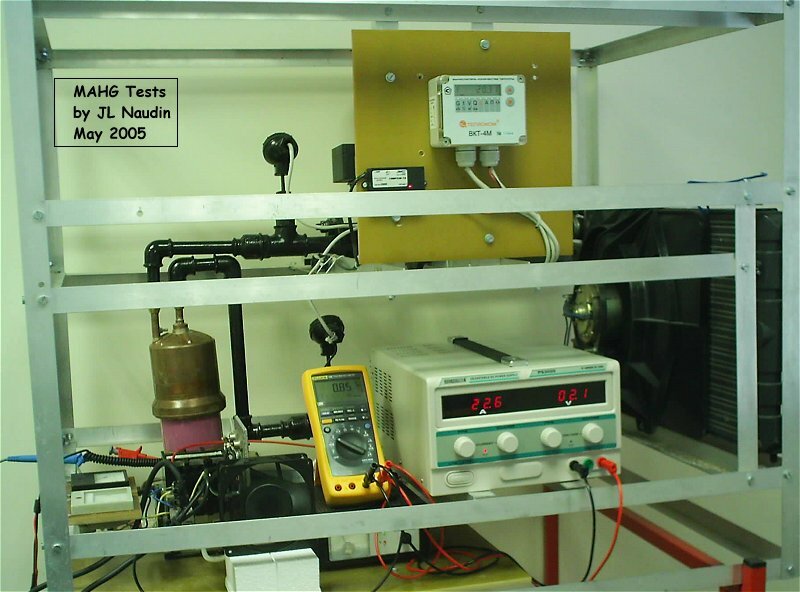 You may notice that atomic hydrogen (1% to 7%) has been produced during only 25 ms each 100 ms.
During the pure DC tests, the filament temperature (774 °K) is not sufficient to create the hydrogen dissociation process which requires at least 2000°K. Above : In red, the curve of the Power OUTPUT Vs the Power INPUT, the green curve is for 100% efficiency. 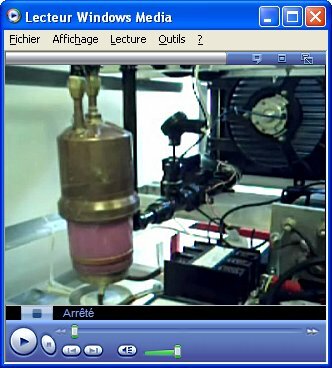 When you add the fact that the hydrogen is not consumed in the burning process, and can thus be recycled, it should become very clear to any scientist, humanist, environmentalist, business executive and indeed to every human being that is concerned about the state of our wonderful planet, that no more time should be wasted. The time has come for removing the responsibility of defining the energy policies and structures of the future from the hands of the established energy industries, and place it in the hands of men of science who will work for the preservation of the environment that sustains all life on Earth. Men who will work for the economic development of the third world by means of providing clean, abundant and inexpensive energy technologies. Such initiative will only succeed when massively supported by the visionary captains of industry who will have the courage to dismantle the existing and scandalous energy grid which now envelopes our planet, by investing in the production and marketing of small energy generators for individual households, factories, transport etc. Once such a generator has been acquired by the consumer, his further energy requirements will be covered for FREE, giving him independence in terms of energy as well as increased buying power for any other economic development.